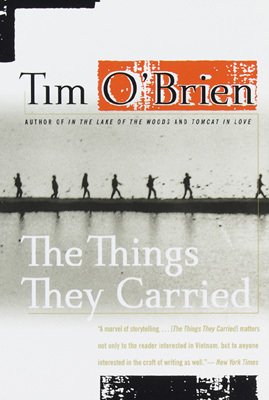 You’re The Things They Carried! Harsh and bitter, you tell it like it is. This usually comes in short,dramatic spurts of spilling your guts in various ways. You carry a heavy load, and this has weighed you down with all the horrors that humanity has to offer. Having seen and done a great deal that you aren’t proud of, you have no choice but to walk forward, trudging slowly through ongoing mud. In the next life, you will come back as a water buffalo. >Not sure it describes me, either:You’re The Great Gatsby!by F. Scott FitzgeraldHaving grown up in immense wealth and privilege, the world is truly at your doorstep. Instead of reveling in this life of luxury, however, you spend most of your time mooning over a failed romance. The object of your affection is all but worthless–a frivolous liar–but it matters not to you. You can paint any image of the past you want and make it seem real. If you were a color of fishing boat light, you would be green. >I got The Great Gatsby, too, Dave. I read it and went: HUH? If this describes me, I don’t know myself at all.